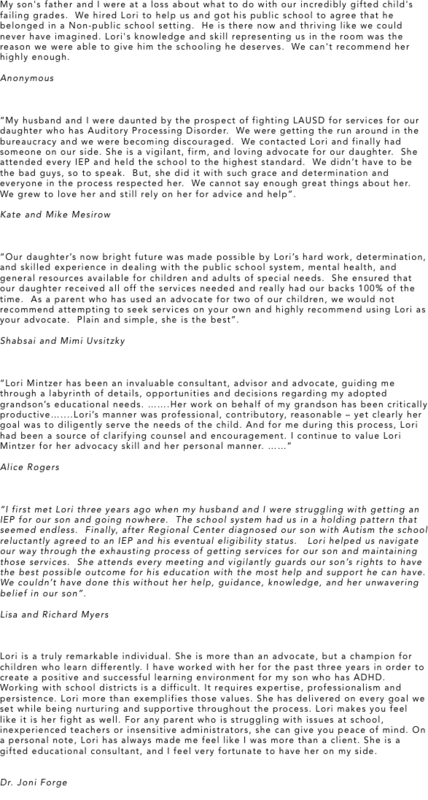 “Our daughter’s now bright future was made possible by Lori’s hard work, determination, and skilled experience in dealing with the public school system, mental health, and general resources available for children and adults of special needs. She ensured that our daughter received all off the services needed and really had our backs 100% of the time. As a parent who has used an advocate for two of our children, we would not recommend attempting to seek services on your own and highly recommend using Lori as your advocate. Plain and simple, she is the best”. “I first met Lori three years ago when my husband and I were struggling with getting an IEP for our son and going nowhere. The school system had us in a holding pattern that seemed endless. Finally, after Regional Center diagnosed our son with Autism the school reluctantly agreed to an IEP and his eventual eligibility status. Lori helped us navigate our way through the exhausting process of getting services for our son and maintaining those services. She attends every meeting and vigilantly guards our son’s rights to have the best possible outcome for his education with the most help and support he can have. We couldn’t have done this without her help, guidance, knowledge, and her unwavering belief in our son”. “My husband and I were daunted by the prospect of fighting LAUSD for services for our daughter who has Auditory Processing Disorder. We were getting the run around in the bureaucracy and we were becoming discouraged. We contacted Lori and finally had someone on our side. She is a vigilant, firm, and loving advocate for our daughter. She attended every IEP and held the school to the highest standard. We didn’t have to be the bad guys, so to speak. But, she did it with such grace and determination and everyone in the process respected her. We cannot say enough great things about her. We grew to love her and still rely on her for advice and help”. Lori is a truly remarkable individual. She is more than an advocate, but a champion for children who learn differently. I have worked with her for the past three years in order to create a positive and successful learning environment for my son who has ADHD. Working with school districts is a difficult. It requires expertise, professionalism and persistence. Lori more than exemplifies those values. She has delivered on every goal we set while being nurturing and supportive throughout the process. Lori makes you feel like it is her fight as well. For any parent who is struggling with issues at school, inexperienced teachers or insensitive administrators, she can give you peace of mind. On a personal note, Lori has always made me feel like I was more than a client. She is a gifted educational consultant, and I feel very fortunate to have her on my side.